Learn how to manage and modify permissions for users on your Listrak account. You change permissions for users on your account easily by following the below steps. 1. Navigate from the home menu to Manage. 4. A list of every user on your account is displayed. Click on the user you want to update. 5. Select access permissions for the user. A description of the each option can be found below. 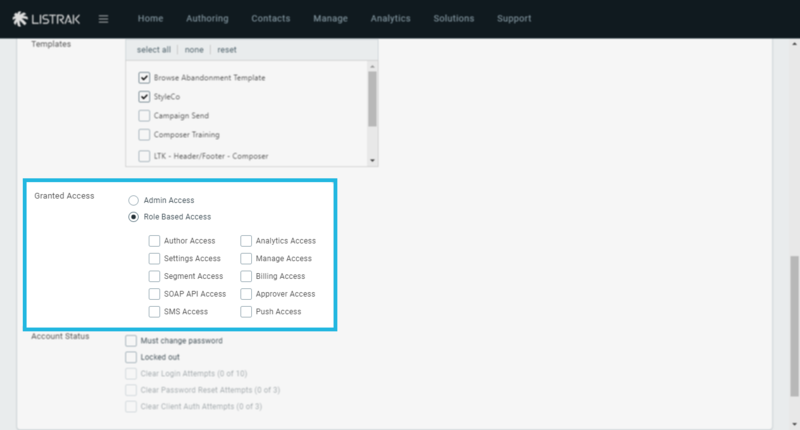 Granted Access: Select Admin Access or Role Based Access. If role-based access is chosen, you'll be given the opportunity to set additional permissions to be attached to each role. Selecting multiple role-based permission types grants the user the combined benefits of each permission. Admin Access: This permission grants the user full access to the Listrak account. Role Based Access: This permission level is customizable and allows you to select from the below access options. Author Access: allows the user to create and send messages to any available lists. The Home, Authoring, Listrak Fusion Apps, and Support tabs will be available when used alone. Analytics Access: allows the user to view message, contact, and list-level analytics for any available lists. The Home, Analytics, Listrak Fusion Apps, and Support tabs will be available when used alone. Settings Access: allows the user to access setting pages under navigation tabs. Must be used in conjunction with another privilege such as Manage Access. The Home, Listrak Fusion Apps, and Support tabs will be available when used alone. Manage Access: allows the user to create, delete, and maintain any available lists. Use in conjunction with Settings Access to modify list settings. The Home, Contacts, Manage, Listrak Fusion Apps, and Support tabs will be available when used alone. Segment Access: allows the user to create and/or modify segments and field groups for any available lists. Must be used in conjunction with another privilege such as Manage Access. The Home, Listrak Fusion Apps, and Support tabs will be available when used alone. Billing Access: allows the user to view and pay invoices for the Listrak account. Must be used in conjunction with Manage Access. The Home, Listrak Fusion Apps, and Support tabs will be available when used alone. API Access: allows the user to perform programmatic API calls for any available lists. Must be used in conjunction with other privileges. The Home, Listrak Fusion Apps, and Support tabs will be available when used alone. NOTE: Typically API users are granted full access to the account via Admin Access. This can also be accomplished via Role Based Access by selecting all permissions except Billing Access and Approver Access. Approver Access: allows the user to be selected as an approver on the list settings page for any available lists. The Home, Listrak Fusion Apps, and Support tabs will be available when used alone. 6. Once you've checked off all of the user's access options, click Save User. NOTE: Listrak allows up to five users. Additional users can be added for a fee. Contact your Account Manager for details.